Day 3, and I took my time walking all around the Central Hall of NAB. I wanted to make sure I didn’t miss any small jewels of gear, and I’m glad I didn’t. Now are some of these must have pieces? Maybe not. But they sure were interesting. The first was the Cinema Devices AntiGravity Cam. 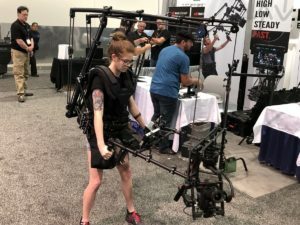 This body mounted, three axis gimbal stabilizer is part gimbal, part crane, and is able to carry a full camera rig by distributing the weight across your torso.This enables the user to carry the camera without fatigue, and if necessary, just to let it hang there. And to underscore this, the guys at the Cinema Devices booth chose a small framed on looker to put on the vest and control a complete RED Dragon rig. Needless to say, she handled it like a seasoned pro, from as low as her ankles to high above her head. All without the need for counterweights, thanks to it’s 4 point suspension system. The website doesn’t advertise a price, but says to contact for a quote. Rentals are also available. Next, I swung by the Back-Bone booth to take a look at their RibCage cage for your favorite action camera. 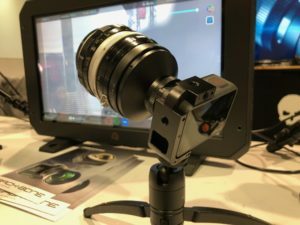 Not only does it fit a standard GoPro, but also Yi Action cameras, and the Sony Rx0. The Ribcage has a built in camera lens adapter, and you can order it for micro 4/3s, EF, Nikon, C mount and other mounts as well. The Ribcage is sturdy and well built, but you have to buy the camera included so the cost is a pricey $899. This is due to having to remove the camera’s lens assembly to make room for the camera lens you’re planning to use. On that note, the rep also told me that while you can use any lens with it, he prefers to use security camera C-mount lenses because they are small and compact, adhering to the original spirit of the action camera design. 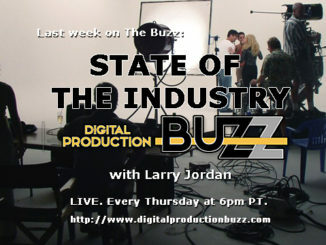 Now you don’t usually think of filmmaking when you think of Marantz. Hell, I think of my dad’s old stereo record player. 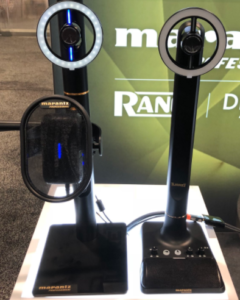 But Marantz is now making waves in podcasting, video blogging, and live streaming with the Marantz Turret. The Turret is an all in one solution for those just starting out in streaming content. 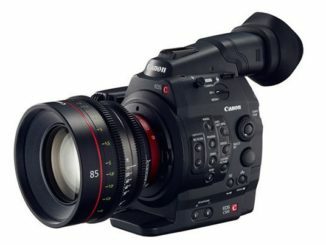 It has an adjustable camera that shoots 1080p, with an LED Ring light to illuminate the subject, and an adjustable boom mic. It connects to your network via USB-C and can record directly to Facebook and YouTube Live. There’s also one with the mic built into the base which was designed for eSports! Cost is $299, $199 respectively. I also got a close up of the Tiffen Steadicam Air and this has to be my favorite product of the entire show. 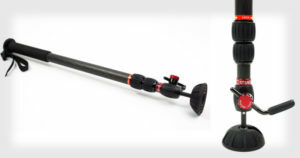 Though not strictly a Steadicam of Garrett Brown’s initial concept, the Air is actually a monopod. It has no clasps to lock down each section. With a pneumatic gas power, users depress a foot pedal to push the gas up and down to collapse or extend from a minimum of 28 inches to a maximum of 62.5 inches. No more fiddling around. It’s deployed in a second and you can grab your shot. 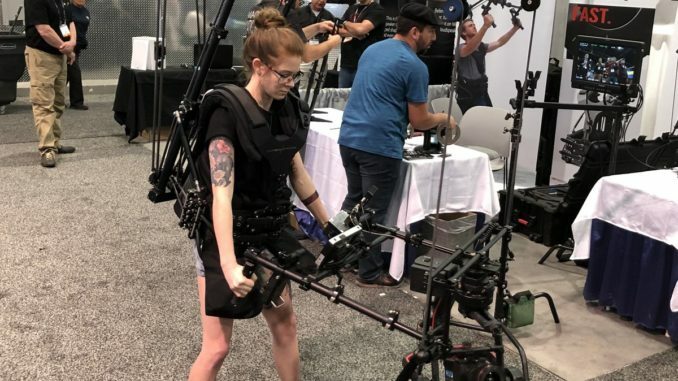 The Steadicam Air comes in a 10 pound and 25 pound model for larger cameras, and price starts at $499, well worth it considering the time a shooter will save setting up. Well, there’s a half day left, and I have only about a mile left to break 20. I’m fairly confident. Stay tuned for what we’ll find tomorrow. 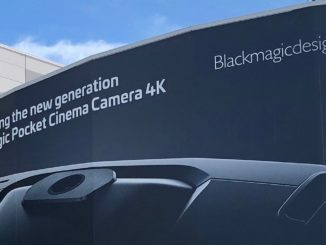 NAB 2018: Lights and Stabilizers and Tripods, Oh My!